Most people are probably familiar with Google Maps, but not everyone knows how to use it for their own benefit. 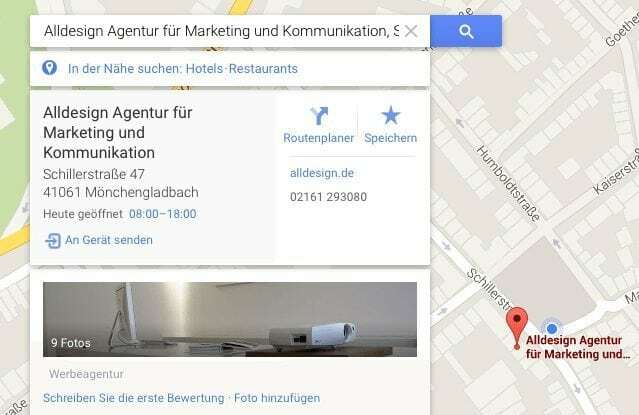 Google Maps can be extremely useful, especially for businesses. It enables you to show your location on the map as an aerial or satellite image. But this actually has very little to do with the location itself. Rather, an entry on Maps—or a place entry as it is known—can help you to achieve a much better hit rate in Google searches. If a company is registered on Google with images and text, the place entry is displayed in addition to the organic hits. Of course, this does require that the user is searching in the region. Having an entry on Maps is also beneficial when it comes to navigation systems. It is relatively straightforward for companies to add themselves to the database with the corresponding details. However, it is sensible to first check whether an entry already exists for the address in question. It may be that Google has already used an old phone book entry, which you can then edit. The more details and photos you upload, the higher the business will place in the ranking. By using the verification function for completed entries, the search engine then “trusts” the entry enough for a positive search result. We therefore also recommend that you assign multiple hit categories under which you would like to be found. It is also advisable to make sure that all details entered on Google Business are identical to those on the business website as inconsistencies can have a negative effect on the ranking. Once all the details have been entered, they must then be confirmed by Google by sending a code. A few days after the code has been entered, the entry will be published by Google and you will be one step closer to a high search engine position.